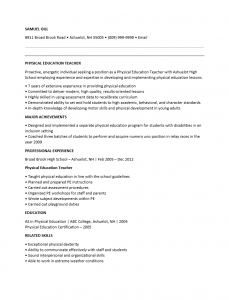 The Physical Education (Gym) Teacher Resume Template provides a medium for gym teachers wishing to compose a resume. The headings will give an outline for a user to fill out. Each section divides the resume into an organized presentation of one’s skills and credentials. In addition, the set format offers a sleek eye-catching design which will serve an applicant well when his or her resume is being viewed in comparison to others in the quick at-a-glance comparison hiring entities perform when first organizing responses. 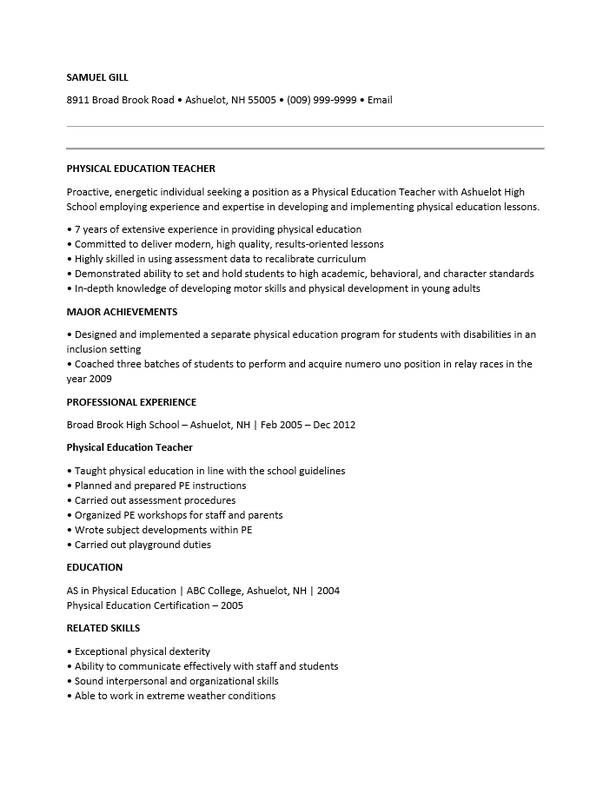 So long as job seekers fill out the physical education (gym) teacher resume template properly they may re-use it as often as they like and can even revise it with ease when gearing it toward a sought out position. There are a few steps one should take to fill out this template properly. One should make sure he or she has set aside a substantial amount of time, has already organized their information (i.e. there should be no question as to when you worked at a previous job), has familiarized themselves with modern phrasing (resume buzzwords), and of course takes the time to proof read everything…twice. A resume template can be a powerful tool in a job seekers arsenal as it will improve one’s chances of attaining an in-person interview. Step 1. Enter your full name on the top line. Enlarge this to be slightly bigger than anything else on the page. Step 2. List your contact information directly below your name. This must be up to date. Step 3. Under the title “Physical Education Teacher” write several statements that generally sum up your career and professional identity in a positive manner. This may or may not include a bullet list but must be professional looking. Step 4. In the “Major Achievements” section give a few highlights to your career such as any achievements that sound impressive or that you are particularly proud of. Step 5. The “Professional Experience” section will be where you give your work history. Each entry should contain the name of a previous employer, its location, the years you were employed there for, and the job title you held. Below this list the duties or accomplishments you were responsible for. Step 6. In “Education,” give the name of the degree you earned, where you earned it, and when you earned it. Any additional academic credentials should go here as well. Step 7. In the “Related Skills” section, list any additional skills or abilities you possess that have not previously been mentioned.